This is how this exploration all began... We noticed this oddly placed elevator in an active Atlantic City casino, called for it, and soon found that it was never intended to be used by guests. There are so many things wrong in this picture but my favorite part about this photo is that there is a random "2" button at the top of the car station. The number plate also is not consistent with the other "2" button. Another extremely unusual consideration is using the ground floor as the fire recall floor (as evidenced by the "star"). The first floor was already boarded up, so if you were unlucky enough to be in this elevator during a fire, it would dump you into an enclosed part of the building that you could not escape. 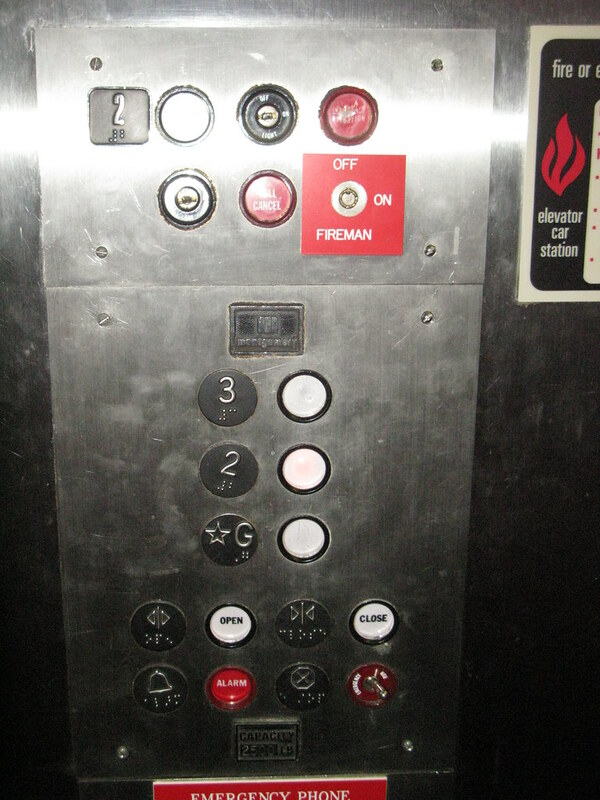 The other thing that is extremely unusual about this elevator is the toggle switch "stop" button. It did not set off an alarm. I can only imagine that at least at one time during this elevator's 30 year run, security was in the elevator with someone when it conveniently "stopped".